As a nation, we have enough food to feed everyone. Yet, over 40 million individuals don’t know where their next meal will come from—while 40% of what we produce goes to waste. Rescuing Leftover Cuisine (RLC) helps get excess food to those who need it, by crowdsourcing transportation. Robert Lee, Louisa Chen, and Paul Sun noticed that larger food rescue organizations will only take in donations of 100 lbs. of food or more. They founded RLC to aggregate smaller donations which would otherwise go unused. RLC created a web application that has volunteers sign up online, then gives them a food-rescuing route—they travel to a food business or event to pick up donations and then drop them off at a registered homeless shelter, food pantry, or soup kitchen. All volunteers need is about 30 minutes of spare time and transportation—whether it’s a car or just your own two feet. Every $1 donated helps provide 8 meals for the hungry. Whether you donate time, food, or money, you’ll be making a difference in people’s lives and helping the environment, too. Hi, this is Robert Lee, co-founder of Rescuing Leftover Cuisine, Inc. Our mission is to provide solutions for companies and individuals to eliminate food waste and make hunger a thing of the past. We do this by crowdsourcing the transportation of excess food to the food insecure through a web application. I'm excited to share our story on The Grommet! How is Rescuing Leftover Cuisine’s approach different from similar organizations? How do you define success and what is your team’s "secret sauce” to success? 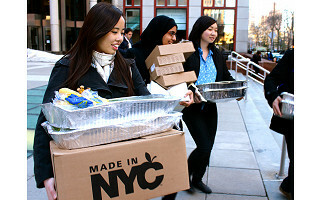 Rescuing Leftover Cuisine crowdsources the transportation of excess food to those who need it through a web application. Many existing food rescue organizations own their own transportation, such as trucks, vans and bikes. However, owning these are expensive, and difficult to scale. We knew we could create more efficient model by tapping into the existing capacity that the public has. People sign up on our web application as volunteers to bring their own transportation methods to the problem – whether it’s their personal car, van, or just their own two feet. Success is subjective, but we as a team define success as achieving the highest potential that we can achieve. Thus, we are constantly learning new technologies, systems, and ways of doing things that are more efficient. This allows us to do even more with what we have. How do you allocate donations? Food donations are allocated based on two factors: proximity and need. The closest homeless shelters, food pantries, and soup kitchens that can really use the food get the food that we receive from food businesses. For financial donations, 95% of all donations go directly to program expenses, as only 5% of our costs go to administrative costs. Donations go to food packaging materials such as aluminum tins, food transportation such as carts, and maintaining our web application technology. Every $1 helps us provide 8 meals for the hungry. What elements of Rescuing Leftover Cuisine’s strategy did you consider essential from the beginning? The use of technology and a structured volunteer system were two pieces of RLC’s overall strategy that have been essential from the very beginning. Our premise hinged on passionate volunteers who wanted to bring their own solutions to the problem of food waste and hunger. We knew that food waste also occurs a lot on the consumer level, and wanted to engage the public to bring them face to face with the amount of food we all waste, and then work together as a community to make better use of this food. Technology has allowed us to grow rapidly while keeping costs low. What reactions have you gotten from people that learn about Rescuing Leftover Cuisine for the first time? What about the shelters and pantries you work with? How have they reacted? We have received all types of reactions! Some say that it is so common sense, and brings an even more common sense solution to the common sense approach of taking excess food to those who need it. Others question the food safety liabilities, and we have to teach them about the Bill Emerson Good Samaritan Act of 1996. Shelters and pantries have welcomed us with open arms, as they often spend a large portion of their budget on purchasing food. What were some unexpected challenges and rewards in trying to redefine a process that has been the same for so long? We have received a lot of pushback initially from food businesses that thought donating food was illegal, and it was difficult to get many food businesses on board at first. However, with more attention on food waste, a federal mandate to reduce food waste in half by 2030, and other countries passing legislation to reduce food waste, we have seen that more food businesses are receptive to donating their food. How is Rescuing Leftover Cuisine transforming communities beyond providing meals and preventing waste—which is amazing on its own? It has been amazing to see how volunteers are getting to know their communities in a deeper way than is typical. Our volunteers have been able to learn where their local homeless shelters and soup kitchens are, and are volunteering at these agencies outside of the food pickups that they do. They are often surprised to find out that they have been passing by a homeless shelter everyday on their way to work, and become much more engaged after learning what they can do to make a difference, no matter how small. These volunteers have helped provide jobs skills training, coats, and other services to our partner agencies, and it has been amazing to see how people can really come together to help each other out. What is the one thing you want people to take away from this feature? We want people to know that every little bit counts. We started Rescuing Leftover Cuisine in a city that already had a food rescue organization, one that has done a tremendous job in rescuing food. But we also knew that there was a gap below 100 lbs of food that was not being addressed, and we believed that any amount of food is worth rescuing, because it can feed someone. This same philosophy has permeated to our volunteer opportunities, as these are an average of 30 minutes, but can make a huge impact. Whether it is time, food, or money, a small amount can make a huge difference. As a nation, we have enough food to feed everyone. Yet, over 40 million individuals don’t know where their next meal will come from—while 40% of what we produce goes to waste. 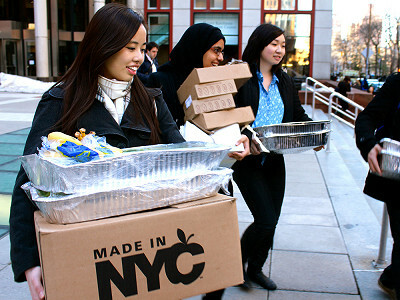 Rescuing Leftover Cuisine (RLC) helps get excess food to those who need it, by crowdsourcing transportation. Robert Lee, Louisa Chen, and Paul Sun noticed that larger food rescue organizations will only take in donations of 100 lbs. of food or more. They founded RLC to aggregate smaller donations which would otherwise go unused. RLC created a web application that has volunteers sign up online, then gives them a food-rescuing route—they travel to a food business or event to pick up donations and then drop them off at a registered homeless shelter, food pantry, or soup kitchen. All volunteers need is about 30 minutes of spare time and transportation—whether it’s a car or just your own two feet.